I was out in the bush for work yesterday, on one of my increasingly rare field days (office bound mostly in the day job these days). 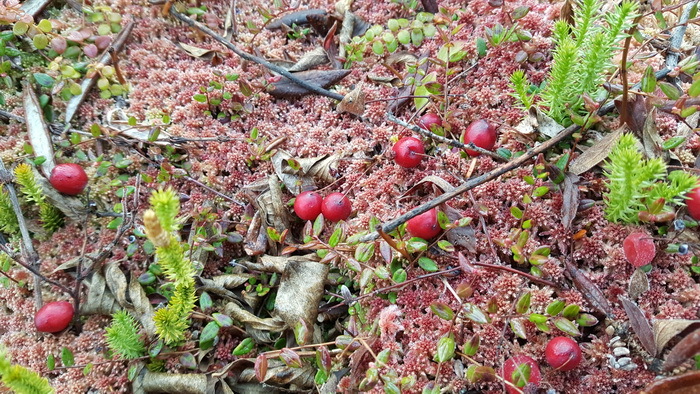 We have had our first frosts, and the cranberries in the spruce-sphagnum wetlands are perfectly ripe now. The frost softens the fruit and makes them much sweeter, less tart. Some cranberries have not yet been touched by frost, and the flesh is firmer and still somewhat tart, but very refreshing. 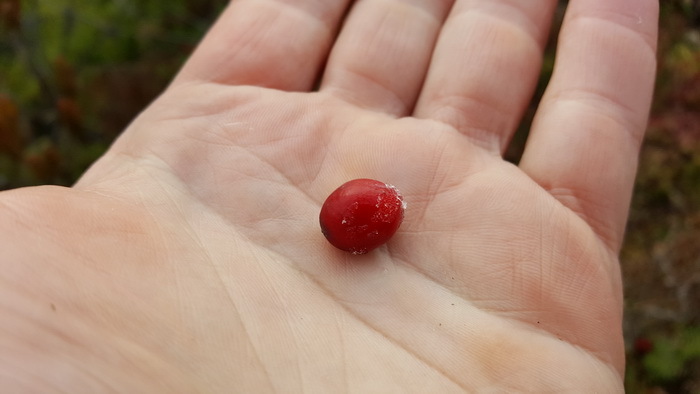 If you have never eaten fresh cranberries off the vine in a bog or conifer swamp, the fruit is very much like a micro apple, with firm white fruit on the inside. 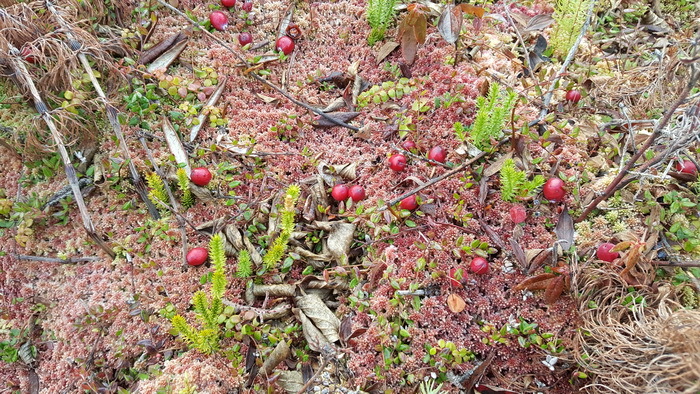 Typical habitat with the cranberries on top of the sphagnum moss. Zoomed in a little closer. You can see the berry on the right is frosted, and this one will be the sweetest. 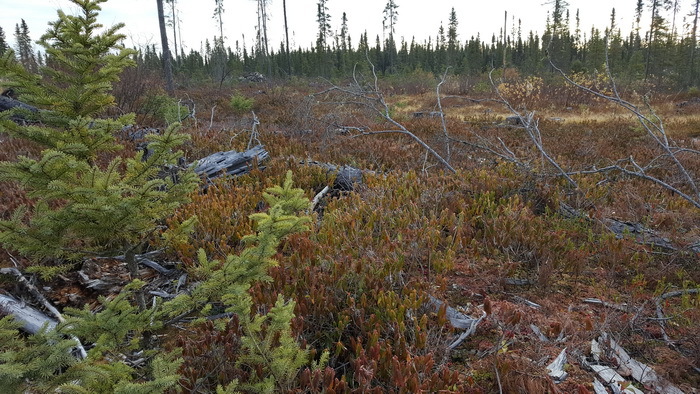 The typical habitat at a larger scale: open black spruce-sphagnum swamp / bog. The low shrub with the closed leaves dominating the wetland growing on top of the sphagnum is Labrador tea. My only experience with cranberries has been via the bogs near Plymouth, MA. Most of them are owned by folks who sell via the Ocean Spray cooperative. There used to be a cranberry museum in Plymouth and they had a working bog, albeit a small one, outside the building. This time of year you could help yourself to the cranberries when they ripened. I was sorry to see it close up and the bog pulled from the area. It was something my family and I looked forward to every year when we sponsored a whale watch out of Plymouth. That's all for now. Take care, enjoy those cranberries (great source of vitamin C if I remember correctly) and until next time...be well.